Ok, let’s get something out of the way right now. We love PSY and Gangnam Style. It is clearly one of the biggest viral videos of all time. Even the most Youtube views ever, sorry Bieber. But for this 2012 list we wanted to take a look at the biggest “branded” viral videos of the year. Videos that were pushing a brand or product of some sort and still got shared. That is a little harder than getting a music video out there. But yeah we still love PSY. This short film (or long Viral Video? ), created by Invisible Children, is an example of how longer form content can still go viral. Shares from top celebrities and a massive existing email list earned this highly-produced video, which urges support for their organization’s mission in Africa, nearly 100 Million views on Youtube alone. The rebroadcast value from news organizations picking up the story made this spread across the world. Thsi $4,500 short and simple video took a new “shave tech” company and launched it out of the blocks like a rocket. 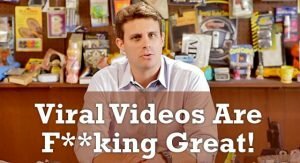 With 8 million views in the 10 months since it first aired in March, 2012, the DollarShaveClub formula should not be ignored. Their budget may have been small, but the talent behind the video knew what they were doing with years of comedy improv and video production under their belts. The results were 12,000 new members in the first 48 hours alone. And in November 2012, they raised almost $10 million in Series A funding, allowing them to expand the business internationally. In the quiet main street that is a dry day on the internet, viral videos bring a little mayhem in our lives. And so, in that same spirit, TNT Belgium put a “Push To Add Drama” button in a quiet town square. And since we all like buttons, everyone walks up, presses it, and instantly becomes part of a brilliant scene of chaos and crime and, well, drama. Who knows if the live action of this video is real or not, I don’t really care. The end product is brilliant and made it all around the world. The video racked up a couple million views, but bigger than that, it got a ton of real world press mentions from Jimmy Fallon to Fox News to Engadget, and hundreds more. The gadget was not really a fully functional device. But the video was so successful the brand is said to be considering making it a reality. Old Spice viral videos have of course been on our radar before. This one is on the list more because of innovation than viral views. Old Spice took their current commercial campaign to Vimeo and created an interactive music video that is as addictive as it is entertaining. After the one minute video you can control the music. Press a key to play an instrument once, hold a key to let it repeat, press it again to stop. Record your creation and share it with a loved one this Valentine’s day. Or burn it, your call. We have seen plenty of stop animation videos, but I am not sure if we have seen a Stock Image animation video before. Stock image seller, Getty Images, pulled together over 800 images, all unrelated to one another, to tell the story of a couple meeting, loving, living, a loss, and more. Very clever and very well done. The Call Me Maybe parody video was in full force this year. And Sesame Street could hardly refuse Cookie Monster when he asked if he could record his own unique version. What do you do if you want to remind the public how dangerous trains are? Easy, kill off a bunch of singing cartoon characters in a lighthearted and very dark song and dance number. 36 million views as of today. It is hard to get past how ODD this video is, but you have to think at least a few lives will be saved along the way. Fiat UK targeted hip moms everywhere with their ‘Motherhoo’ rap. The lyrics pull no punches and it is likely NSFW, but the entertainment quality is unquestionable. A simple basketball court, where an unsuspecting pick-up game gets schooled by the older, grey-haired “Uncle Drew.” After missing a few shots, and some shots of the crowd enjoying their refreshing Pepsi Max, Uncle Drew begins to outplay everyone on the court. Of course Uncle Drew is really Cavs rookie Kyrie Irving with a lot of makeup, some padding, and a bit of limp added on for good measure.